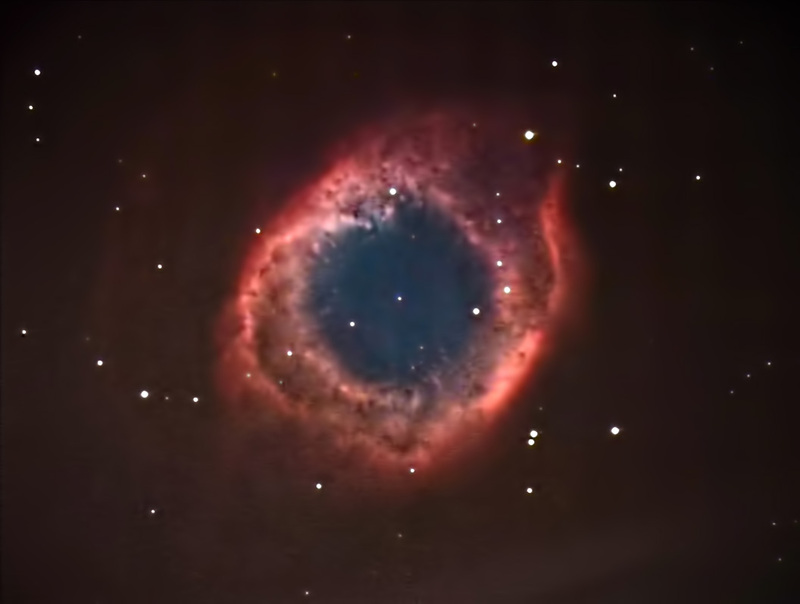 NGC 7392 is commonly known as the Helix Nebula. It has also been referred to as the Eye of God. It is the closest of all the planetary nebula with an estimated distance between 450 and 700 light years. It spans 16' (25' including the halo); this is nearly the width of a full moon. It is also the first planetary nebula discovered to contain planetary knots (on the inner edge of the nebula - not clearly visble in this image). Each knot is about the size of our solar system. Planetary nebulae are formed when a star reaches the end of its life cyle. The supply of hydrogen runs out and the star begins fusing helium into heavier elements (i.e., Carbon, Nitrogen, Oxygen). The remaining star becomes a white dwarf, which heats up the expanding material. Our sun will experience the same fate in approximately five billion years. Processing: Ha images were focused, calibrated, aligned, and combined in CCDSoft. Color images were calibrated, aligned, and combined in using ImagesPlus. Ha and color images were aligned in RegiStar and the composite image was adjusted in Photoshop. Sharpening and noise reduction were done using Topaz Detail and DeNoise respecitively. The color image was obtained years ago and was used in my previous web page on this object. This was difficult to capture at my location in southeastern Minnesota (N 43 deg., 43 min.) as I needed to halt exposures to shoot between trees.